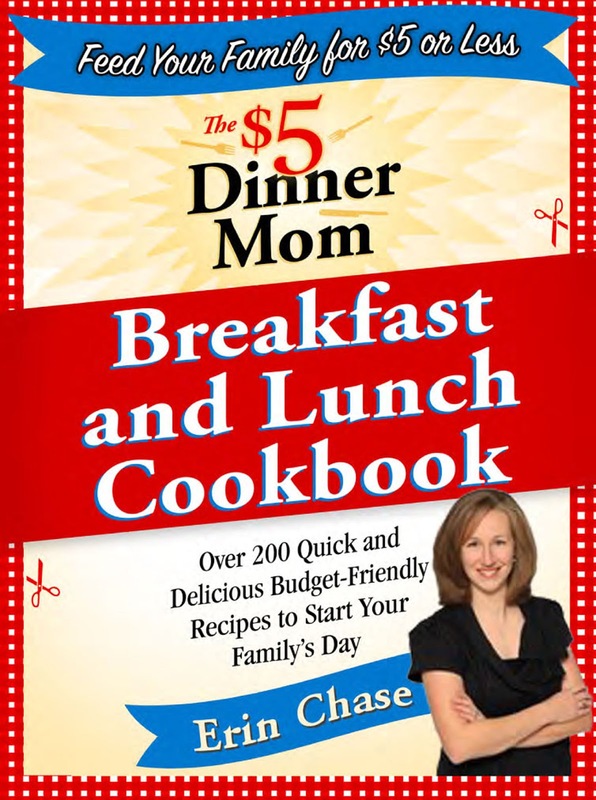 $5 Dinner Mom Breakfast and Lunch Cookbook Review & Giveaway! Trying to find healthy tasty meals inexpensively sometimes feels next to impossible. If you have been following my blog for awhile you will know I love reading $5 Dinner Mom blog by Erin Chase. Erin is a mom of 3 boys. Erin lived and worked in the Dominican Republic where she met her husband and learned to shop responsibility, plan and execute 3 meals a day, 7 days a week for 12 teenage boys when she and her husband were houseparents. Now those are some skills for sure! Review: I really enjoyed reading through this book. Erin share's lots of great tips for freezing, batch cooking and saving money throughout the book. Erin also shares some meal planning idea's and also different ways to batch cook while you are preparing dinner without a ton of extra work. Each recipe has the price for each ingredient and a total cost. These cost are from where Erin lives, in the Midwest, USA. I have found that most of the meals are more for myself but still not really expensive and when you watch for sales and use coupons the price comes down. There are so many recipes I am looking forward to trying, especially all the wraps and muffins that can be freezed for a great on the go meal.Southwest Sausage Muffins, Cheesy Sausage Muffins, Sausage, Egg and Cheese Breakfast Taco, then all the great salads including Minestrone Pasta Salad,Taco Salad and Broccoli-Raisin Salad. I will be able to keep busy this spring and summer for sure. The first recipe I tried was the Banana Blueberry Loaf Bread and it turned out very yummy. I don't think I needed to mix it as much as I did but it still was good. Here is what it looked like when Abby and I were finished baking them. Where to Connect: There are tons of different ways to connect with Erin Chase visit her on $5 Dinner Mom Website, Blog, Email, Facebook and Twitter. Where to Buy: You can purchase either of $5 Dinner Moms Cookbooks on Chapters.ca and Amazon.ca or check out places in the US here. 2. Win! One lucky Canadian Coupon Mom will with their very own copy of Erin Chase's The $5 Dinner Mom: Breakfast and Lunch Cookbook! Mandatory Entry: Please visit $5 Dinner Mom and come back to leave me a comment on a recipe you would like to try or something you learned from Erin. Please do this first before any Extra entries may count. Please include your email address in your comment. This giveaway is open US and Canada. This giveaway ends on March 13th, 2011 at Midnight EST. One winner will be chosen by Random.org on March 14th, 2011 and notified by e-mail. Please respond within 48 hours or a new winner will be selected. Good Luck! what a great website! Hands down the recipe I am going to try is Mexican Bean Tostadas. I am going to make them tonight! Her corn and sausage casserole looks so yummy! I have been a reader of hers for a long time...before she had any book deals! :) She's great! I liked $5 dinners on fb! I'm glad to know she's on fb! I'd like to try the recipe: Dana’s Lightened Up Chicken Parmesan (Freezer Friendly!) I do a lot of freezer cooking, and this would be perfect. I like $5 Dinner Mom on FB. I'm glad I saw this post- I think I've found someone to follow- I like her! I would like to try the Italian Wedding Soup. I liked Canadian Coupon Mom on Facebook. Oh definitely the chicken parmesan. I am always looking for new freezer friendly meals! I like $5dinners on facebook. i would love to try the cream puff recipe also.. sounds devine. I would love to try her ginger maple pancakes...yum! The DENISE’S CREAM PUFF RECIPE looks so yummy! Like" $5 Dinner Mom on Facebook. Follow $5 Dinner Mom on Twitter. I'd try the lightened up chicken parmesan. I would love to try Alea’s Steak and Asparagus Frittata. I have her $5 dinner book and love the homemade sauces. I would love to try the Bacon, Broccoli and Tomato Pasta Salad. I'd love to try the corn and sausage casserole! I would like to try the Egg and Cheese Breakfast Taco. "Like" $5 Dinner Mom on Facebook. I would love to make the autumn chicken.